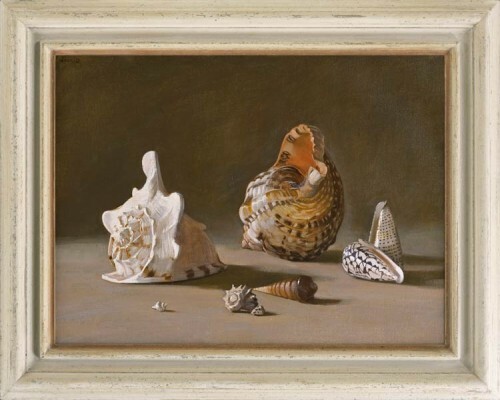 A small sub-genre of still life painting, pictures of shells became very popular in the 17th century, particularly in Holland, where one of the pioneers of shell painting was Balthasar van der Ast. This interest in shells was part of the general enthusiasm for scientific inquiry, and for the collecting of cabinets of curiosities. Shells could be appreciated on several different levels: as well as innately decorative, they could be seen as another type of memento mori, setting the enduring, vacated carapace of a dead animal against the ephemeral structure of a flower. All this inherited significance shadows this beautiful, ornamental arrangement of shells by Stephen Rose. Like our forebears, we are fascinated by the exotic forms and tactile surfaces of shells; they still exert a sense of scientific marvel, and an appreciation of their beauty and age. Other, newer relationships have accrued, such as shells used in near-abstract works (Georgia O’Keffe, Inside clam shell, 1930). A 21st century work can thus be imbued with complex meanings, as here in the beautifully-realized, semi-abstracted forms of these varied shells, as they rest and brood in a tranquil, vibrating space which conjures an idea of the sea bed.